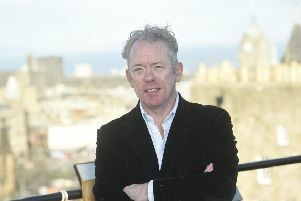 He is one of Scotland’s most successful living writers, publishing more than 100 books and selling more than 40 million novels around the world. But now Alexander McCall Smith has revealed he has become a theatre impresario in South Africa. Speaking at the Edinburgh International Book Festival, the bestselling author revealed he is now the owner of a tiny 50-seater venue in Cape Town. He has joined forces with Nicholas Ellenbogen, a leading actor, playwright, director and producer in Cape Town, to run the Rosebank Theatre, a former drama school. The Zimbabwe-born writer, who shot to fame with the first No. 1 Ladies’ Detective Agency novel 18 years ago, has worked on several drama and opera productions during his career. He previously joined forces with Ellenbogen – who founded the Theatre for Africa company in 1989 with wife Elizabeth – when he directed McCall Smith’s opera based on Macbeth, which transferred the Shakespearean tragedy to a troupe of baboons. McCall Smith was speaking at the first of three events at this year’s book festival, where he is traditionally one of the most popular draws. McCall Smith said: “I’m quite a regular visitor to Cape Town – it’s a really interesting part of the world. “I really did this for Nick, who has been a friend of mine for many years and has his own theatre company who are able to put on all kinds of different shows throughout the year. “I was passing through Cape Town and when I saw Nick he said he was quite interested in this place, which was originally built as a house and has been a theatre school most recently. “When I saw it I thought it was just gorgeous. He was hoping to get a lease for it at that point but I wondered whether the landlord would sell it. He was very happy. “It was very much an impulse thing to buy it. I don’t actually go to see that much theatre. “But I’ve seen what pleasure Nick brings to people. He’s a great encouragement to actors at the beginning of their career. McCall Smith, a former professor of medical law at Edinburgh University, has become one of Scotland’s most prolific authors over the last 15 years. As well as the No. 1 Ladies’ Detective Agency books about Botswana detective Precious Ramotswe, other bestselling series include 44 Scotland Street, The Sunday Philosophy Club and Corduroy Mansions. Other projects have included a Scottish Opera collaboration to mark Glasgow’s hosting of the Commonwealth Games in 2014 and his instigation of The Great Tapestry of Scotland.